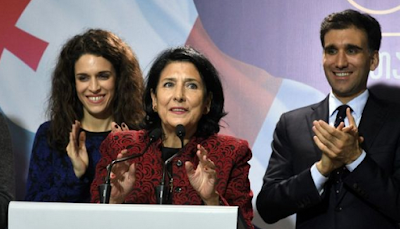 Salome Zurabishvili has won Georgia’s presidential election, becoming the first woman to hold the office. With nearly all votes counted, the French-born ex-diplomat had 59% of the vote with rival Grigol Vashadze on 40%. Ms Zurabishvili was backed by the ruling Georgian Dream party while Mr Vashadze was a united opposition candidate. Ms Zurabishvili, 66, was born in Paris after her parents fled Georgia in 1921 following its annexation by Soviet forces. She took up a career in the French foreign service and was posted to the Georgian capital, Tbilisi, as ambassador in 2003. She later gave up her post and the then-president of Georgia, Mikheil Saakashvili, appointed her foreign minister.